Today’s cartoon is from Red and Rover, a strip set more or less in the 1960s, when a lot more kids spent their entire summers barefoot. It appeared just this past Tuesday, August 26, 2014. This was a common problem (and yes, in the comic strip, Red really has spent his entire summer barefoot). Additionally, with the reference to Hawaii, I wonder if the cartoonist sometimes listens in to barefooters’ discussions. In its daily feature of a photo of people-about-town, that Columbus Dispatch picture will occasionally be of a barefooted person. A couple of days ago it was of some kids building a tree fort at a local park. 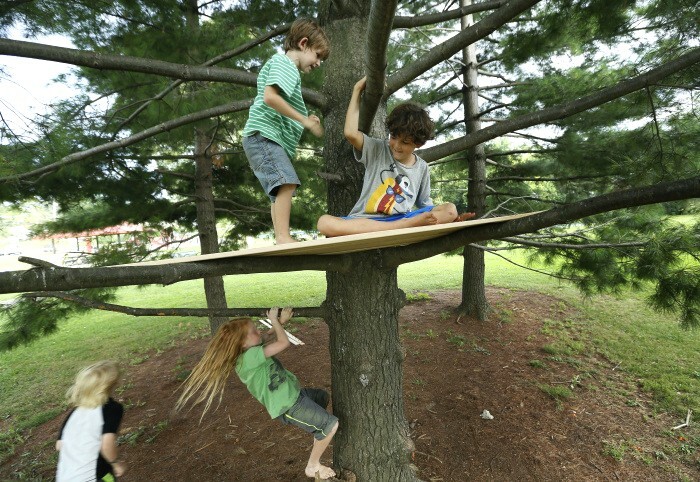 Master Builders | At Clinton Como Park in Clintonville, these four are building a tree fort. In the tree are the Reider brothers — 7-year-old Koen, left, and 9-year-old Aiden. Still on the ground are the Moore brothers — 9-year-old Clay, left and 7-year-old River. Yesterday while writing about barefoot driving I described a ticket somebody got for doing so, and then how the judge allowed the policeman half an hour to find the actual statute before finally dismissing the ticket (because no such statute existed). But what about when driving a commercial vehicle, like a semi? 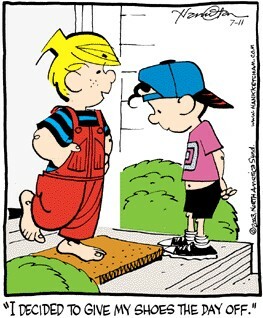 For our comic this weekend let’s go with an old stand-by, Dennis the Menace. This one is from July 11, 2003. Somehow I manage to make that decision every day . . .